Graphic notation (or graphic score) is the representation of music through the use of visual symbols outside the realm of traditional music notation. Graphic notation evolved in the 1950s, and can be used either in combination with or instead of traditional music notation. Composers often rely on graphic notation in experimental music, where standard musical notation can be ineffective. Other uses include pieces where an aleatoric or undetermined effect is desired. One of the earliest pioneers of the technique, along with John Cage, was Earle Brown, who sought to liberate performers from the constraints of notation and makes them active participants in the creation of the music. Graphic notation first appeared in the 1950s as an evolution of movement of Indeterminacy as pioneered by John Cage. 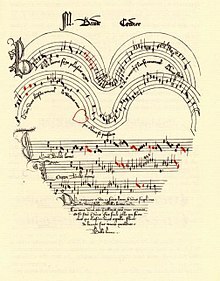 [contradictory] The technique was originally used by avant-garde musicians and manifested itself as the use of symbols to convey information that could not be rendered with traditional notation such as extended techniques. Graphic scores have, since their conception, evolved into two broadly defined categories, one being the invention of new notation systems used to convey specific musical techniques and the other the use conceptual notation such as shapes, drawings and other artistic techniques that are meant to evoke improvisation from the performer. Examples of the former include Feldman's Projection and Stockhausen's Prozession. Examples of the latter include Earle Brown's December 1952 and Cardew's Treatise, which was written in response to Cage's 4'33" and which he wrote after having worked as Stockhausen's assistant. The score consists of 193 of lines and rectangles on a white background where. Here the lines represented elements in space and the score was merely a representation of that space at a given instant. In Europe, one of the most notable users was Sylvano Bussotti, whose score were even often displayed as pieces visual art by enthusiasts. In 1969, in an effort to promote the movement of abstract notation, John Cage and Allison Knowles published an archive of excerpts of scores by 269 composers with the intention of showing "the many directions in which notation is now going". Other notable pioneers of graphic notation include composers such as Roman Haubenstock-Ramati, Mauricio Kagel, György Ligeti (Artikulation), Krzysztof Penderecki, Karlheinz Stockhausen, and Iannis Xenakis, Morton Feldman, and Christian Wolff. In 2008, Theresa Sauer edited a compendium featuring graphic scores by composers from over fifty countries, demonstrating how widespread the practice has become. Time-based pictographic scores such as Waterwalk by John Cage, uses a combination of time marking an pictographic notation as instruction on how and when to perform certain actions. Line staves showing approximate pitch, with the actual pitches being decided upon performance. Altered notation can be seen in George Crumb's work, where he uses traditional notation but presents the music on the page in a graphic or nontraditional manner such as spirals or circles. This device, however, was not an innovation of the twentieth century. It is found, for example, in some pieces composed by Baude Cordier in the late 14th century, and in a piece by Joseph Haydn in the late eighteenth century. New specific notation system, that is, a new of specifically and graphically notate musical actions like that of Xenakis' Psappha. Time-based abstract representation, can be seen in Hans-Christoph Steiner's score for Solitude in which the music is represented using symbols and illustrations. Note that here, time is still represented horizontally from left to right like in a pitch graph system, and thus implies that the piece as a specific form. Hans-Christoph Steiner's score for Solitude, created using Pure Data's data structures. Time-based abstract notation, such as Rudolf Komorous's Chanson utilises abstract notation with time indication, or least a direction in which the piece is read and therefore implies a form. Free Abstract Representations, such as Brown's December 1952, where the form, pitch material and instrumentation are left up to the performer. Free Abstract Notation, such as Mark Applebaum's "The Metaphysics of Notation" and where elements of traditional music notation are melded with abstract designs. ^ Taruskin, Richard. "Chapter 2 "Indeterminacy."". Oxford History of Western Music. New York, USA: Oxford University Press. Retrieved April 7, 2018. ^ Taruskin, Richard. "Chapter 2: "Indeterminacy"". Oxford History of Western Music. New York, USA: Oxford University Press. Retrieved April 7, 2018. ^ Cage, John (1969). Notations. New York, NY: Something Else Press. ISBN 978-0685148648. ^ Sauer, Theresa. Notations 21. Mark Batty Publisher. p. 010, 2008. ^ John Bergsagel, "Cordier's Circular Canon," The Musical Times 113, No. 1558 (December 1972): 1175–77 (passim); Ursula Günther, "Unusual Phenomena in the Transmission of Late 14th Century Polyphonic Music", Musica Disciplina 38 "Aspects of Music in Church, Court and Town from the Thirteenth to the Fifteenth Century" (1984): 87–118, citation on 91. ^ Joseph Haydn, Heiligen zehn Gebote: 1, "Du sollst an einen Gott glauben", H. XXVIIa:1: autograph manuscript, 1791; Luciane Beduschi, Composer’s Opinions about the multiple Solutions for Their Puzzle Canons”. EuroMac 2014, Leuven. ^ Taruskin, Richard. "Chapter 2 "Indeterminacy."". Oxford History of Western Music. New York, USA: Oxford University Press. Retrieved April 8, 2018. ^ Heigemeir, Ray. "The Metaphysics of Notation". Stanford Libraries. Retrieved 9 April 2018. ^ R. Murray Schafer at National Arts Centre ArtsAlive web site. Retrieved 2011-11-17. Cage, John, and Alison Knowles (1969). Notations. New York: Something Else Press. Lieberman, David 2006. Game Enhanced Music Manuscript. In GRAPHITE '06: Proceedings of the 4th International Conference on Computer Graphics and Interactive Techniques in Australasia and South East Asia, ACM Press, Melbourne, Australia, 245 - 250. David Schidlowsky (ed.) (2011) Musikalische Grafik—Graphic Music: León Schidlowsky. Berlin: Wissenschaftlicher Verlag. ISBN 978-3-86573-620-8. Bergstroem-Nielsen, Carl: Experimental improvisation and notation practise 1945-1999; Experimental improvisation and notation practise, addenda 2000-. Online bibliographies. HighC: a graphic score-based composition system inspired by Iannis Xenakis' UPIC system. Cuaderno de Yokohama by Llorenç Barber The complete series of 17 graphic scores that Barber created in Yokohama (Japan) in 2005. Ràdio Web MACBA: Barcelona, 2009.